This entry was posted in family, life and tagged care giving, caregiver, dad and daughter, dementia, elderly parents, living with tension, Parkinson's by terry morgan. Bookmark the permalink. Thanks so much for those wise words. Yes, I think respect is key – no matter what – and humor. Great reminders. Thanks for reading and commenting! Yes, this old age stuff is really sad. Thanks for reading and commenting. It’s tough when the one you’ve been holding at arm’s length because of a lack of gentleness becomes the needy one–and the gentle one. 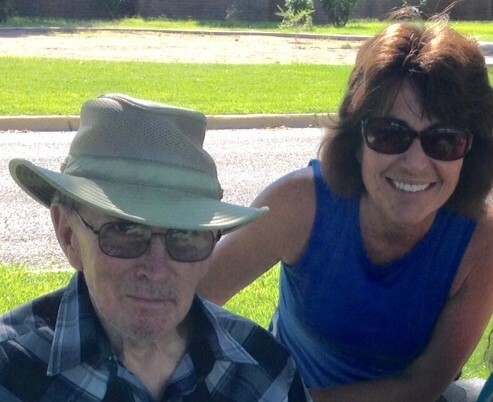 I love how you describe your dad and his transition–and his challenges. Life never slows, does it? It changes, ebbing and flowing and forcing us to either flex and have faith in the God who walks with us or be frustrated and plow through with our meager attempts to control it. I love how you love your dad well. Thanks for the encouragement, Dayle. I feel like I do very little – my sister(s) is the hero – but I am glad to be able to do what I can. It is a challenge to me and my willingness to care for him – or anyone – when there is no real thanks or appreciation. The priniciple applies in many relationships – as you well know. Love you, friend. Amen! Our dads sound a lot alike. That was a crusty generation! I savor the memories of caring for my dad. It was a holy time. I was caught off guard when I realized how frightened he was at the prospect of dying. I was so startled to find him willing to talk about my beliefs that I was very unsure of how to proceed. If I have any regrets, it is that I didn’t step into those conversations with more confidence and direction. At any moment the little girl in me expected to get “the look” that would send me “to my room.” I needed to relax and lean into the opportunity more confidently. Drink in the moments! Thanks, Karen. Those are great words of wisdom and empathy! They are sacred days that we have together – thanks for the reminder! Terry, Your blog brought back memories of the years I cared for mother. Everything you write is what I experienced and I think it’s ok to not know exactly what to do in each situation. It keeps you dependent on your Heavenly Father in a fresh way. Savor the moments you have with him and when he’s no longer there you will be thankful you gave him this time! Love you! Thank you, Alice. I have thought of you so often and refer to things I remember you telling me as I talk with my sister. I may try to connect with you again when we get back to O-Town. Love you, friend!